Preheat oven to fan 200°C, conventional 220°C, gas 7. Flour the surface and unroll pastry sheet. 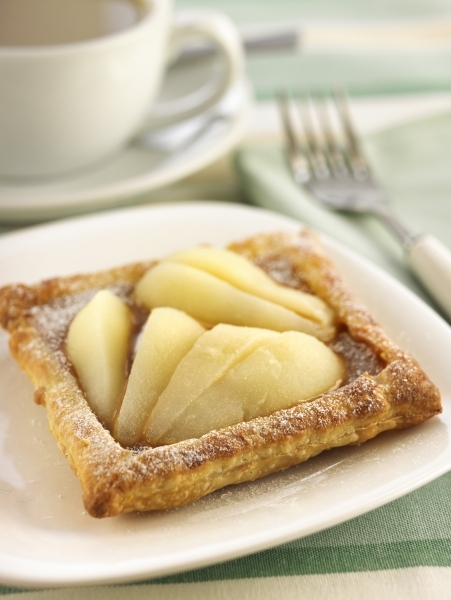 Cut pastry in half horizontally and then cut each half into three squares. Lay the squares onto baking sheets. Using a knife mark a 1cm border on each, being careful not to go all the way through the pastry. Brush each square with beaten egg. Bake for 10 minutes until golden and slightly risen. Remove from oven and leave to cool for five minutes. Carefully rescore each border to release steam and then gently push down the centre of each tart. Using an ice-cream scoop divide the caramel between the tarts, pressing it down slightly to allow it to spread evenly. Sprinkle each tart with a pinch of sea salt. Fill each tart with the pears and then return to oven for a further 8-10 minutes, to allow the caramel to spread and the pears to warm through. To serve allow to cool for 10 minutes, and then dredge each tart with a little sieved icing sugar.